Almost 8,000 years ago farmers recognized its value. With the fertilizer application season approaching, it is once again time for producers to make decisions about their fertility programs. Soon many fertilizer-application rigs will be in the fields, spreading great quantities of fertilizer. 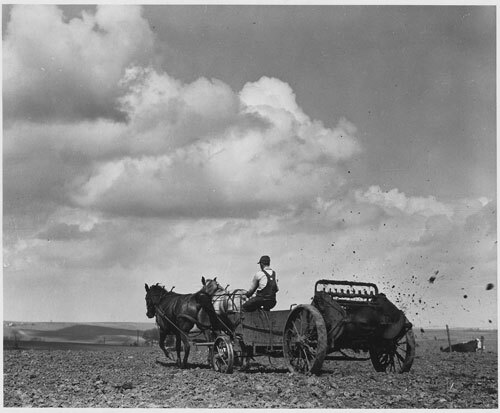 A manure spreader is operated in 1941 in Shelby County, Iowa, in a USDA Bureau of Agricultural Economics photo from Wikimedia Commons. Early farmers used manure to fertilize their crops thousands of years ago, even before farm machinery was invented to make the task more efficient. Because the use of fertilizer has become such an integral part of modern farming, we rarely give any thought as to where it comes from, how long it has been used and what impact it has had on our food production. With our current ability to test our soils nutrient levels and then convert those soil test results into reliable application recommendations, farmers' biggest concern regarding fertilizer use is how much it costs, how much is needed, and which fertilizer formulation to apply. This has not always been the case. Current fertilizer practices are relatively recent and date back to just the last half of the 20th century; however, traditional fertilizer practices are much older. So how did farmers thousands of years ago realize that manure could increase their yields? The researchers concluded that early farmers probably first noticed enhanced crop growth in areas of natural dung accumulation where animals gathered. These areas of high fertility would have been obvious to subsistence farmers who saw differences in productivity between their small plots. Next week's CropWatch will feature information on a shift from using manure to bones as a fertilizer and to recognizing and developing the chemical properties of fertilizers.